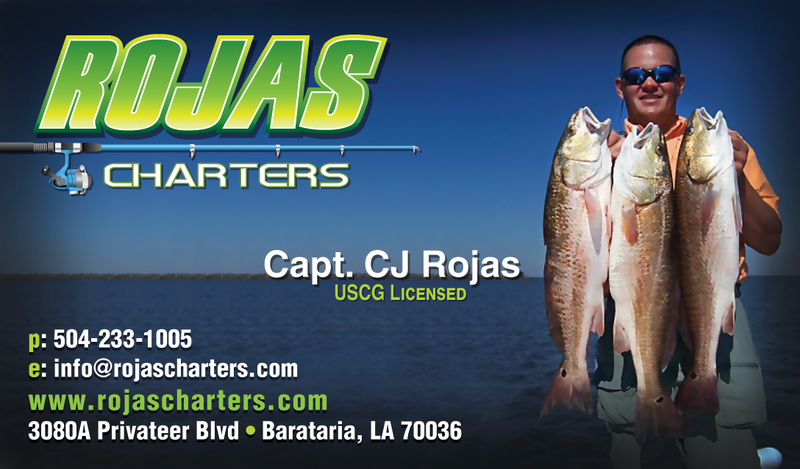 I’m Capt CJ Rojas, Jr. and have been a charter guide for the past 20 years. Mr. Sid Bourgeois at Joe’s Landing, a local marina booked my first fishing charter on May 3, 1998. Since that time I had the opportunity to work for many local charter companies and fish with some wonderful people, but I always dreamed of owning and operating my own business. The decision to name my business ROJAS CHARTERS was easy. I am very proud of my name and heritage. My grandparents on my dad’s side were born in Clarksville, a fishing village south of Lafitte. My grandmother on my mom’s side was raised on a houseboat along the bayous of south Louisiana and my grandfather was a lifelong crab fisherman. I spent a lot of time on the water with my grandfather and through the years watched the signs of Clarksville disappear little by little. Now I fish those same waters my grandfather worked on. Because my father ‘Big C’ was also a commercial fisherman, I spent summers trawling for shrimp. He owned and operated seven trawl boats throughout my life. He was a great fisherman, always catching his share of shrimp. I like to think I was his best deckhand. I learned the inland waters and tides from him at a very young age. Any free time I had was spent fishing and hunting. At the age of nine I inherited my grandfather’s boat and 35 horsepower motor. That was a herd of horses back then! Along with my younger brother Casey Rojas, we graduated from stringing catfish lines across the bayou to venturing out into Lake Salvador and further places my mother, Sandra didn’t know about. As a teenager I spent my summers working for my uncle in the Gulf of Mexico on a 90ft trawl boat called the Iron Maiden. Even during those offshore trips any spare time was spent fishing. After graduating college and trying a ‘REAL JOB’ for a couple of years, the bayou began calling my name. I started guiding part-time and soon after it became my full-time job now spending an average of 240 days a year on the water. It didn’t take long for me to realize I could make a living bringing people out on this beautiful estuary to enjoy the past-time I had loved my entire life. Fishing has been a lifelong endeavor for this BAYOU BOY, my family and I invite you to come have a great time and create many lifelong memories. I am very excited to have my brother Captain Casey Rojas team up with me at Rojas Charters this year! Captain Casey has been a successful fishing guide since 2003 and he is certain to deliver a fishing trip you won’t soon forget. Captain Casey has been fishing, working, and navigating the local waters just as I have from a very young age.